Who’s ready for WYD 2016? Rio de Janeiro is still rocking from Pope Francis’ explosive visit, but some are already looking ahead to the next installment of World Youth Day. On Monday it was announced that the honors for 2016 will go to Kraków, Poland, which means that the first World Youth Day after the canonization of Pope John Paul II (late this year or early next year) will take place in his own hometown. World Youth Day? I built that. Since I’m lucky enough to spend a few weeks there every summer for work, I thought I’d compile a list of Must See places in Kraków. I came up with ten. The first five are big-ticket items, major landmarks and such. Most pilgrims to Kraków will see most of these whether they try to or not. The second five, which I’ll post tomorrow, are much less obvious, and even a careful pilgrim might miss them if they don’t know what to look for. These include some of my personal favorites. But before we get to our Big Five, there’s one place that must be mentioned. If past papal visits are any indication, the B?onia Krakowskie (Kraków Commons, it’s basically just a really big meadow) will be the site of WYD 2016’s “Main Event”—the all-night prayer vigil and the closing Mass with the Pope. John Paul II said Mass here four times as Pope, and Benedict XVI offered Mass here during his visit in 2006. The B?onia isn’t the beach at Copacabana, and there are certainly no palm trees, but pilgrims will be a lot less likely to come home with sand in their sleeping bags. So there’s that. B?onia: No palm trees, lots of grass. The Market Square with the Sukiennice and the tower of the Old Town Hall. Kraków’s Main Market Square is one of the great public spaces, not just in Poland, but in all of Europe. It covers roughly the same area as seven-and-a-half football fields and is lined with cafes, restaurants, shops, and (since it’s in Poland) churches. At the center of the square is the great Cloth Hall (Sukiennice) where you can buy all kinds of Polish goodies—from amber jewelry, to animal pelts, to hand-painted icons. Always lively, the Market Square is the hub of activity in Kraków’s Old Town. 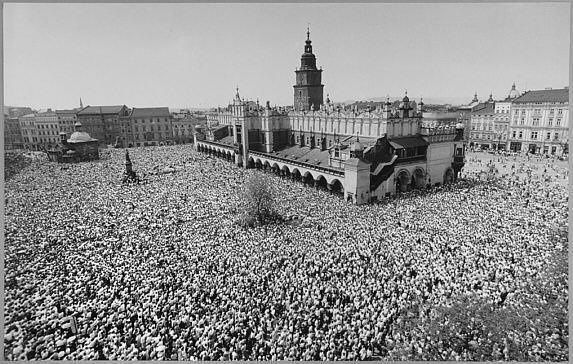 On May 17, 1981, as Pope John Paul II lay in a hospital bed with near-fatal gunshot wounds, a half-million Poles (dressed all in white) marched from the B?onia into the Market Square to join Cardinal Macharski at a Mass to pray for the Pope. The Communists were, shall we say, less than thrilled. The Market Square is also home to the greatest of Kraków’s many churches: the gothic basilica of Our Lady Assumed into Heaven, usually known simply as the Mariacki. The Mariacki’s distinctive towers dominate the Kraków skyline. Its breathtakingly painted interior and world-famous wooden altarpiece make it a must see. Unlike some other places in Europe which will remain nameless, the great churches of Kraków are used for, you know, worshiping God. The Mariacki has, I believe, twelve daily Masses, along with daily adoration from 10 a.m. to 6 p.m.
And don’t miss the trumpeter who plays from the tall tower every hour, on the hour, 24 hours a day. Legend has it that a medieval trumpeter played the same tune as a warning to the city that the Mongol Horde was approaching. He was shot through the throat by an arrow as he played, and so the melody today still ends abruptly and unfinished. Wawel Castle and Cathedral overlooking the river. Without a doubt, Wawel (pronounced VAH-vel) is the beating heart of Polish culture. Once home to Poland’s kings and queens, when the capital was moved to Warsaw in 1596, the royals still came here to receive their crowns. Many of Poland’s greatest patriots and cultural icons are buried here, as are Sts. Stanislaus and Jadwiga. The cathedral is built right into the castle fortifications and has been the seat of bishops of Kraków since the 11th century. Over the main door of the castle are written the words, Si Deus nobiscum quis contranos? (If God is with us who can be against us? ), a reminder to all of us that there is but one Lord of History. Mercy, that’s an ugly church! St. Faustina is buried here, and the world famous image of Divine Mercy hangs in the small convent chapel above her sarcophagus. (It is the most famous image, but not the original, which is in Vilnius, Lithuania.) The large Sanctuary of Divine Mercy is something of a travesty of sacred architecture—a cross between the Jetson’s apartment, a gargantuan food processor, and the World Series trophy—and it is a few kilometers outside the city center, but the place is definitely worthy of a pilgrimage. Pope Francis has made the mercy of God a central theme in his young pontificate. Potshots at the architecture aside, the Sanctuary of Divine Mercy can be a profoundly moving place and easily makes the short list of Catholic sites in Kraków. Still under construction, the John Paul II Center is only a few hundred yards from the Divine Mercy Shrine. It is being built on an artificial hill, a great slag heap left over from the Solvay chemical factory where Karol Wojty?a worked during World War II. It was there that the young Pole first read St. Louis de Montfort who gave John Paul II the inspiration for his episcopal motto, Totus Tuus. The main church (see photo) is almost finished, and the crypt chapels are beautifully done. The Center will eventually be home to a variety of charitable and volunteer organizations, research institutions, and a, perhaps, a library. If all goes as planned it will become the “definitive” John Paul II shrine and pilgrimage site in a land filled with John Paul II shrines and pilgrimage sites. So those are the Big Five. Tomorrow, I’ll list five places that are less well known, but no less worthy, that you won’t want to miss.